Back in 2002, I volunteered to bring my daughter’s seventh grade class out on an overnight wilderness survival camping trip. We were deluged with 1.3 inches of rain overnight – and had nothing to keep us dry but shelters built of sticks and bark. But we had such a great time that I have continued hosting the Junior High Camping Trip every year, and it is now written into the Harrison School curriculum. Being a small school, we bring all of the seventh and eighth graders out together for three days and two nights each May. The outing is very hands-on oriented, engaging the kids in the many activities shown in the video above and much more. Instead of merely talking about nature, science, and the way that our ancestors lived, they experience it directly, being deeply immersed in this unique outdoors experience. However, it also seems important to reflect on the experience afterwards and process it on another level. 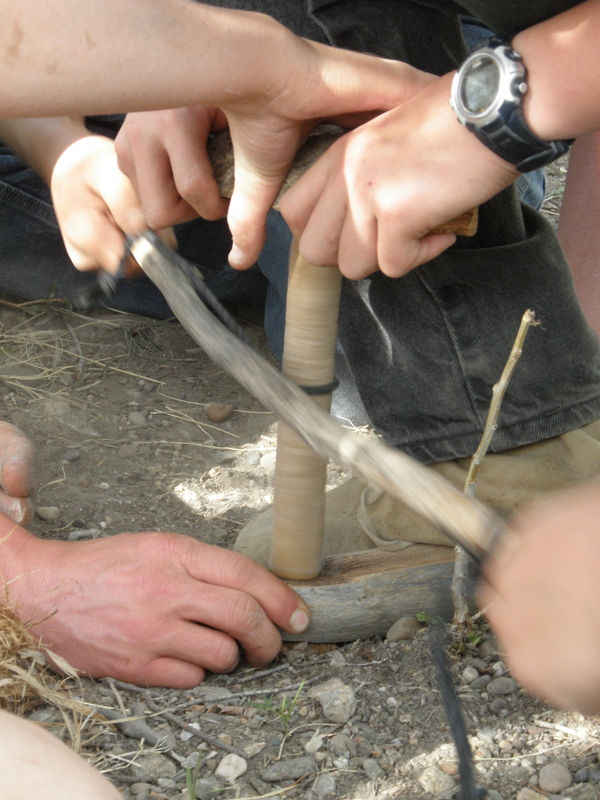 Junior high students work together to construct a bow and drill fire set and start a fire with it. I sit up, feeling a small breeze hit my face. Sunlight streams from the small holes the wooden shelter doesn’t cover. My people are already gathering mint leaves for tea, so I slip on my worn moccasins and crawl out of the wickiup. Voices, speaking in our native tongue, surround me as I walk to the fire. I glance at the slightly curved stick and wooden board knowing that one of my tribe members must have used a bow and drill to create friction, and eventually fire. Looking at my father’s shiny brow tells me that he made the fire. He nods at me, so I turn and jog into the peaceful, wide band of trees. The awakened wilderness engulfs me, and drops of dew glisten on the green plants and a nearby spider web clinging to a tree branch. As I search for a fairly dry piece of wood and a mid-sized stone, I carefully avoid a duck nest lying underneath a small tree. The two weapons I grab will be used to hunt for prey. Cautiously, I place one foot in front of the other, like a fox, ducking underneath branches, trying to make as little sound as possible. Disturbing the forest and its creatures could cost my tribe and me a morning meal. I hear a scurrying beside me and quickly pause to turn my head to the noise. A rabbit crouches behind a shrub, nose twitching. It turns to dart away from me, but it waited a moment too long. I have already clutched and thrown my stick at the rabbit’s gray body before it has moved a hand’s length. I carry the limp creature back to camp with my teeth peeking out of my mouth. I lay the furry animal, along with three others, beside an elder. She will cut the rabbits with a deer rib saw knife and toss the meat into a smoking pan to be cooked. The fur could quite possibly be used as a garment later. Students wade into the swamp to gather cattail roots (rhizomes) and shoots for our meals. Next, I run like a coyote, with knees reaching my chest, to a marsh only a short distance from my home. There, cattails roam the inky waters. Taking off my footwear, I wade through the knee-deep substance. I pull many cattails from their roots, feeling the muck seep between my toes. With the plants in both hands, I head back to camp, hearing the birds sing their sweet melodies. All of a sudden, the noise to my right stops, and I can only hear a steady, staccato bird warning call. 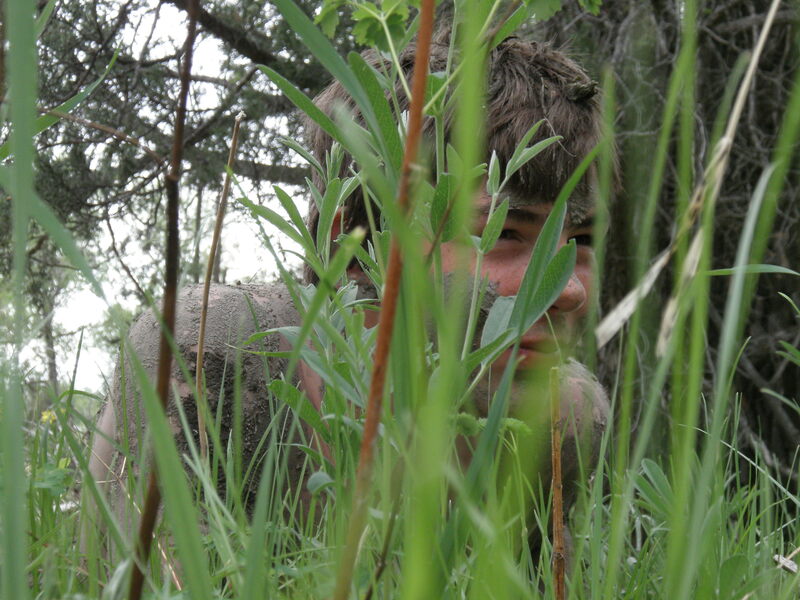 I turn my head right and catch a glimpse of tan, buckskin clothing disappear behind a tree. I faintly call out, and my little brother’s head peeks out. I laugh, and with him by my side, we pick dandelion leaves and flower heads to go with the cattails. 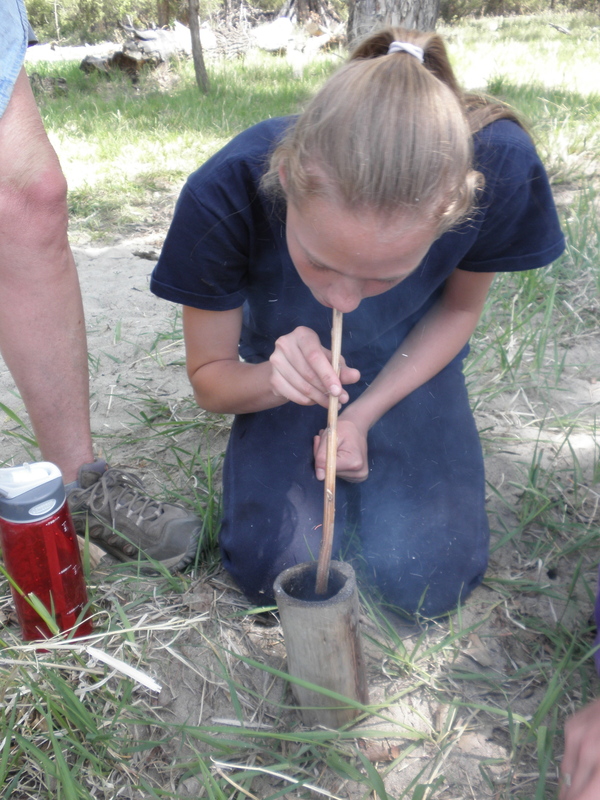 Taya uses hot coals and a blow tube to burn out a cup from a section of cottonwood root. Once we are back, I chop the pale cattail roots into a wooden bowl I had made by blowing on ashes in the center of a log to burn a deep hole in it. I add the dandelions, and soon adults and children have gathered to eat the salad. The greens that didn’t fit in the bowl, I lay on a bark plate. The sun is completely out by the time our meal is gone. I quietly sip my mint tea, from a cup also burned with ashes, staring at the gray sky near the mountain peaks. I then gather my belongings and toss them in my shelter. To prepare for dinner, we move the fire to a different location, so there is now a hot pit. While some are placing stalks of cattails in the pit, others are putting in fresh deer meat, killed with an atlatl, a device used for throwing a long dart. Roots, wild plant leaves, and other greens are also added to the pit. It is then covered with grass, picked by little fingers, bark pieces, water to create steam, and finally soil. We covered ourselves with mud, then played stalking games in the woods. While the food is steaming, which will take a few hours, I gather all of the children. Their challenge is to get as close as possible to one of his/her parents without being spotted. We all crawl in thick mud. I crawl on my stomach to get as low as possible to my mother. She is sewing moccasins and a shirt. I look at the men, and they are either sharpening their knives or brain-tanning hides. My father is trying to tan my rabbit hide. The game ends after a few hours, with my brother winning. Being so small, he was unnoticeable. I go to help my father, and soon, dinner is ready. A few pieces of meat did not cook thoroughly, but other than that, the food was delicious. Right after we are done eating, the rain shower hits us. I wash my bark plate in a stream and then head to my wickiup. Although it’s not very late, my eyes feel droopy. I rest my head and slowly close my eyes, oblivious to the rain pounding. I think about being a bird and come to a conclusion. We are alike. I am free in this place, and so is the bald eagle. I spread my wings and drift into sleep. For more information about the Junior High Camping Trip, be sure to read Outdoor Classroom (Bozeman Daily Chronicle, 2011) and more comments from students of the 2011 camping trip. Also, take a look at our Classroom in the Woods DVD, and please check out our Stone Age Living Skills Programs for Schools for more information about our classes.